FOR YOUR LATEST ENTERTAINMENT NEWS, MUSIC AND VIDEO DOWNLOADS,STAY HOOKED WITH US! I won’t spare them the venom in my tongue on this one because when you’re arguably the biggest label in Africa, you do not come out looking like a bunch of total flukes in an elaborate mock-show of what was the biggest record of the entire Nigerian entertainment since it’s inception. 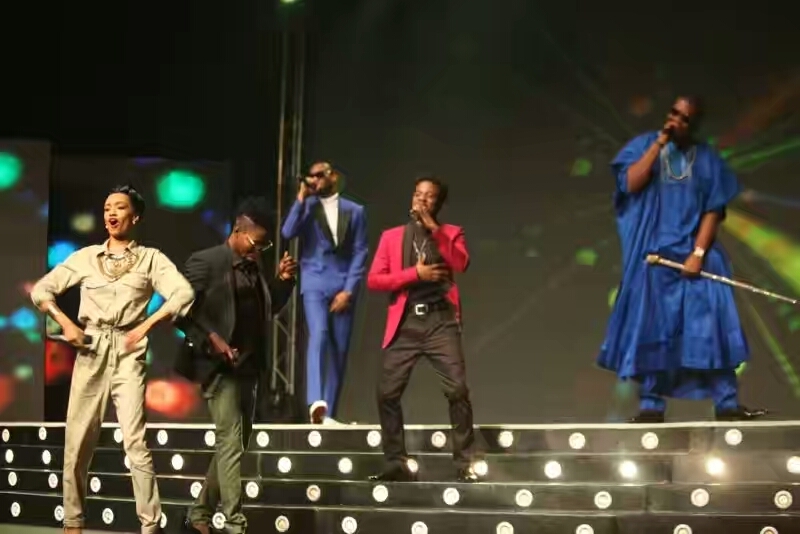 The recently concluded AMVCA had a couple pitfalls and by a stroke of happenstance, the Mavins’ and their whatchamommacallit performance of Dorobucci happened to be atop the list. It was drab, it was dreary, witheringly scornful, awfully uninspiring and pretty much forgettable. The organizers of the show should have allowed everyone a pee break or a 5-minute recess in it’s place. Reekado Banks was prancing up and down the stage like a horse on ecstasy locked up in a paddock, Korede Bello was busy attempting the electric slide in his own world of utopia, D’Prince looked like a typical conformist who still couldn’t comprehend what was going on, Di’Ja was either peeved by everyone being in her space or was finding a way to give them their space and Don Jazzy (as a boss man) perhaps didn’t give a flying fvck about anything. All he prolly knew was that they got paid for that bxtch afterall. Sigh. The beauty of a song resonates when you effectively communicate the innate feelings, desires and motivation behind waxing a record in a manner that is entertaining to a live audience. And on more than one occasion, the Mavins have failed to deliver. First, it was the official video. Everything was wrong with it and even Reeky Banks’ dance improvisation couldn’t save the four minutes and forty-one seconds of our lives that had been wasted watching it. Next, was the commissioning of the Akwa Ibom State Stadium. They literally just showed up in almost angelic costumes to dance and push their hands up in the air while a backing track played. That was no performance my people. There was also that ‘Road to MAMAs’ thang that reeked of nothing but excess energy only and now, this scathing seloquesence at the AMVCA. It’s one thing to be a musician, I mean almost any and everybody can… going by the doctrines upon which our industry was founded. Then it’s totally another to be a performer. Not just anybody can, which is why in an industry like ours, you don’t need the voice of a Praiz to become the next Davido. So when artistes that we idolize come out to deliver in such precipitate manner, it tells enough about the perspective in which they view themselves and their fans. It’s only here that our stars behave irrationally and are patted on the back as they get away with it. This recurring feat has obviously eaten deep into the kankerfabrics of our Nigerian music as every aspiring musician is in a hasty wait to buy a set of gold blings and a Range Rover so they can thump hard on the renal of anyone who poses a ‘hater-threat’ to them with Instagram and Twitter being the only weapons in their new positions of power. It is very very unacceptable, and they’re not even Chris Brown! In other unrelated news, can someone please do something about Korede and Ayoleyi’s looks? They’re members of a dynasty (that even has supreme as part of it’s prefix), they’re like a revolutionary movement! Korede shouldn’t always come out looking like he’s been dressed in costumes that were picked out from the funeral closet of Michael Jackson and as for Ayoleyi… Ifeanyi Nwune to the rescue, PLEASE! Dencia too, maybe?